Some of you may remember that in the 1950s, there was a television show called Dragnet. It was immensely popular to the point that it influenced life in the era. A famous catchphrase came from the show: “Just the facts, ma’am.” People still use it today and probably don’t even know its source. But watching old episodes of Dragnet gives the viewer a chance to see how far our technology has come. 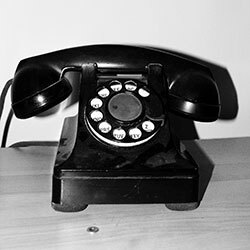 In the 50s, we didn’t have mobile phones, computers, 1-800 numbers, area codes, call forwarding, voicemail or faxing. Everyone, including the police, had to get by with without communicating with each other quickly unless they were in the same building. Even then, if it was a big building, it would be a challenge to find someone. But let’s focus on the fax machine. The majority of us have seen a modern day police or attorney television show. There’s A LOT of paperwork which needs to be moved around the building, city, county, state or country. In the mid-1900s, offices used couriers, cars, wireless transmission or snail mail. Need a signature on an arrest warrant? Hop in your car and drive to the courthouse or place it in the mail. Want to send a legal agreement to the main office? Hand it to the college student with the bicycle. Instead of getting an immediate answer, you had to wait. And remember, FedEx, DHS and Express Mail didn’t exist back then, so you had to go to extra lengths to send something overnight. Sometimes you had to send the documents with a person on a plane. Very inefficient use of time. In 1985, the modern fax machine made our lives much easier. Of course, there were still some documents which needed a courier, car drive or special delivery, but for the most part, communication became quicker while wasting a lot of paper. Halloo Fax Receive provides you with a dedicated Toll-free Number for your inbound faxes. You can manage and view your faxes online, or forward automatically as a TIFF (image file) to multiple email recipients. The number is never busy and makes receiving a fax more beneficial to everyone. And your paper waste is minimal which makes Mother Nature happy! This entry was posted in Fax Receive and tagged dragnet, fax, fax receive by Kimm Antell. Bookmark the permalink.